The world-renowned Terracotta Warrior and Horses Museum is located in about 40 kilometers (25 miles) away from Xian city center. The public transportation is very convenient to get there. In the east square of Xian Railway Station, you will find the tourist bus 5 (306), which runs very frequently when it is fully seated from 08:00 to 19:00 daily. The bus rides takes around one hour and the ticket fare is CNY7. You would get up earlier and enter the museum before the big group crowds. From the ticket office to the entrance, there is still about 700 meters long walking way. Alternatively, you could take the tourist sightseeing cart. Hereunder is the admission fee and opening hours of Terracotta Warrior Museum. There are three pits open to the public, and immensity of Pit 1 is amazing. You will see numbers of clay life-size soldiers and horses in their original setting. Even you stand there, it is still hard to believe just how immense in area and number of terracotta warriors were made some 2200 years ago. And there is still so much to be uncovered. It is a bonus to see the archeologists piecing the soldiers back to their original state from thousands of broken pieces, which are truly magnificent. You would spend few hours to tour around this awe-inspiring sight. It is recommended to hire a local tour guide so that you can pick up all the background information. It costs around CNY 150 to hire a guide. If you feel hungry, take a look at the restaurants around the museum. There are also many fast food chains, like MacDonald, KFC, Starbucks, and Subway. After finishing your visit to the Terracotta Army Museum, you may reverse your trip back to Xian Railway Station and get to the next destination, City Wall. It is the most complete ancient city wall in China. From the railway station, you could walk eastward along the circular City Wall Park to the North Gate of City Wall. During the 1.7 kilometers long walking trip, you would not only enjoy the beauty of the park, but also see local people's leisure activities there. Alternatively, you may take bus 703 with only four stops to reach the North Gate, where you ascend the City Wall. The admission ticket is CNY54 for adults and CNY27 for children between 1.2-1.4 meters (3.9 - 4.6 feet). The wall covering 13.7 kilometers (8.5 miles) in length with a watch tower each 100 meters, around the oldest part of the city is very impressive. It looks even better at night when it is lighted up. It is a fun way to rent a bicycle and ride around the wall. The whole circle takes 1.5 to 2 hours at a medium speed. 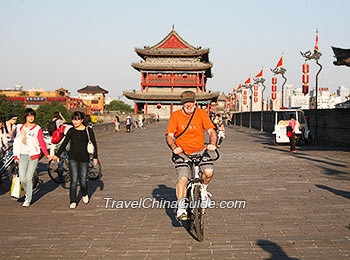 The bicycle deposit is CNY200 and the single bicycle costs CNY45 every two hours and the tandem costs CNY90 every two hours. You will have to pay an extra charge if you cycle more than two hours. It is recommended to rent a bicycle at North Gate and ride to reach the South Gate, where you can return the bicycle before 20:00. The South Gate is the most beautifully decorated one, which is near the city center. You could find more buses back to your hotel there. Yaozhou Kiln Travel: visit Mt.Yaowang, Yaozhou Kiln, Yuhua Palace and Huangdi Mausoleum. Foping Panda Valley: 2 days to visit the Foping Panda Valley from Xian. 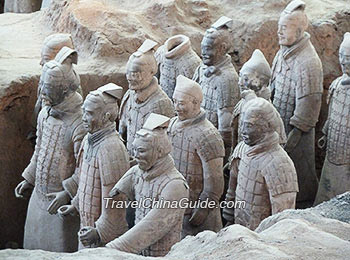 Qianling Exploration: One day independent tour to Qianling Mausoleum and Tang Bo Art Museum. No, the Google and Gmail can not be accessible here. You may use other email or search tool. How I can go from Xi'an airport to Yangling? Do you have any suggestion (comment, hotel, map) about Yangling Agricultural High-Tech Fair (CAF)? You can take airport shuttle bus to Xianyang Railway Station, where you will take train or bus to Yangling. Yangling Agricultural High-Tech Fair of 2013 will be held from Nov 05-09, 2013. For more details, you may browse their website. are there English explanations/translations available at the Museum Gardens, Yangling? Yes, there are Chinese-speaking and English-speaking guides available at the Museum Garden of Northwest A & F University, Yangling. Xi'an weather is mild with clear four seasons - a warm but uncertain spring, a torrid and wet summer, a cool and rainy autumn and a dry and cold winter. The pleasant April and May as well as the cool September and October are the ideal time to visit Xi'an.